Planning to build your dream home? 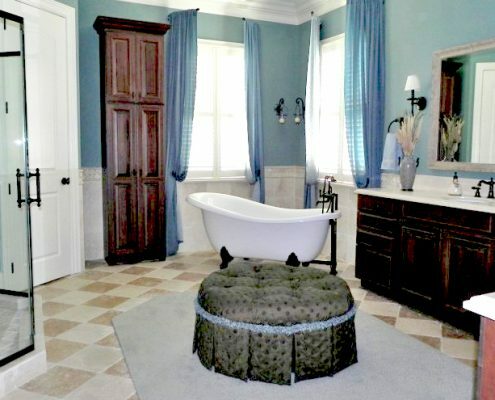 Make your master suite amazing with a luxurious bathroom. If you need some ideas and you want to try the latest trends in master bathrooms, consider these possibilities. Then be sure to find Greensboro builders who can take your ideas and turn them into a beautiful bathroom you can enjoy for years to come. Bold Patterns. The return of wallpaper in bathrooms is a reality. Patterned walls offer texture and create the illusion of space. This can be accomplished by creative taping and painting or much more easily through wallpaper. Natural Light. Having privacy doesn’t mean sacrificing natural light. Windows that are tinted, frosted, or dressed with blinds, shutters, or curtains provide the necessary privacy while still letting in plenty of light. Save energy as well by using less electricity for lighting. Glass Doors to Separate Bathroom from Bedroom. Recreate the resort-style bathroom from your last vacation to enjoy every day. French doors or windowed walls can separate the master bedroom from the bathroom without such a hard barrier. The natural light from the bathroom spills into the bedroom as well like a tropical vacation spot. Ornate Tub Surround. If you like to take long, relaxing baths, make the tub a major focal point in your master bath. Consider a surround option made of wood or tile. For a luxurious, deep tub consider steps leading up to the rim for easier entry and exit. Serenity Now. Design a relaxing bathroom retreat with soothing colors, warm textures, and a Zen style. Pastels like blue if you prefer cool colors or pale peach if you prefer warm colors will create a serene atmosphere with your own personal touch. Sliding Doors. For the sake of style and space, sliding doors are gaining popularity. Offering the option to open up your space or close it off when privacy is preferred, the versatility is a major advantage here. Include Seating. If your goal is luxury, don’t forget to add some seating in your bathroom. Whether it’s a stylish vanity chair or a chaise lounge to stretch out on while you self-administer beauty treatments, your bathroom will feel like a day at the spa. Plan for the Future. If this is your dream home, ask yourself if you plan on aging in place. One of the most important areas of your home that will require modifications for age is the bathroom. Plan for the future now by installing a low-step or roll-in shower stall, plenty of handles and handrails, wide doorways, and low counters. You’ll be thankful for these features later. Your dream bathroom should be a relaxing, beautiful room that allows you the space you need for your daily routine as well as a luxurious retreat from the stress of the day. Not all Greensboro builders can give you the same level of quality and style in a master bathroom. R&K Custom Homes has designed and built some extraordinary bathrooms featuring many of the ideas above. Expert designers and builders can incorporate your ideas into a bathroom that suits your style and vision. Call (336) 643-3503 for a free consultation.